iMessage(s aapl), the new free messaging service introduced in iOS 5, is easy to set up, but group messaging can be a bit harder to work out straight away. There are a couple of limitations to know about, but other than that, group messages work really well with iMessage. To start a group conversation, open Messages and tap the compose button in the top right corner, which looks like a pencil inside a square. You’ll be taken to the New Message screen, which contains the “To:” field. On the right edge of the screen is a blue plus icon, which you can tap to select a contact to add to the conversation. You can also type a person’s name, phone number or email address directly into the field to add them that way. If you do add multiple people, the message will be sent to all the people listed, forming a group conversation automatically. If you receive an iMessage as part of a group chat, the conversation’s entry in the Messages app will have the group icon (which looks like the silhouette of two people) to the left of it. It’s easy to tell which participant sent the message even in a group chat; the person’s name will appear above the message itself when you look at the conversation. When you reply to the conversation, everyone will receive the message. There are a few caveats when using iMessage for group conversations. Firstly, when adding contacts to the conversation, make sure you enter everyone’s name the first time, because the participants of a group chat can’t be edited after the first message has been sent. In order to add people after that, you’ll have to set up an entirely new conversation. Another thing to keep an eye on when setting up a group chat is that the bubbles in the To field stay blue. If they turn green, it means that one of the recipients can’t receive iMessages, so the entire conversation will be sent using SMS instead. If this happens, wait a few seconds in case they turn blue again, as sometimes it takes a second to check that all recipients are able to use iMessage. You can still send group messages via SMS, but it won’t have all the features of iMessage. The good news is that anything you can send in an iMessage to a single person can be sent in a group message. That’s text, photos, videos, audio and contacts. However, it’s not clear whether sending a group iMessage uses more mobile data than a single message does, so keep an eye out when sending attachments to multiple people that you don’t go over any usage limits you may have on your plan. I am using an iPhone 4 with iOS 5. This seems very odd. When I try to enter a contact in iMessage, it brings up all contacts with phone number info only. If does not bring up any email contact info. Almost like it is doing SMS only. When I go to contacts and use “send message” from there, it works but the name which is displayed is not the contact name but a corrupted email address (if it was joe@blow.com, the result would be joeblowcom. 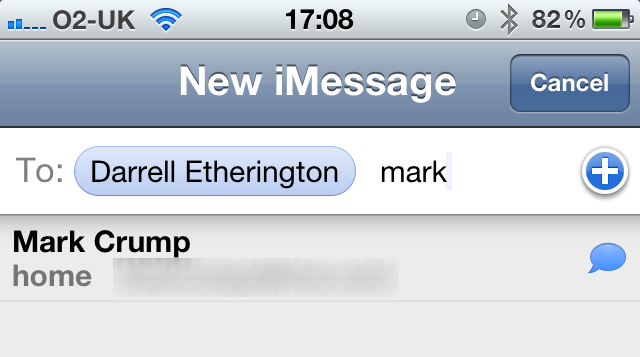 This actually works however and I do send the message as an iMessage. The problem is that lookups fail from iMessage and consequently, I can only enter one contact into an iMessage (because I have to start the iMessage from the contact app). I have SMS turned off (have tried this with it on and off). I have restored and reloaded my phone but no change. I have compared this to two other iPhone4’s which work correctly and see no difference or clue. I have tried everything I can find in iMessage, Contacts and Mail but regardless of what I change, the fact remains that iMessage is failing to see email addresses and is only bringing up phone numbers for contacts. Anyone else seeing this? Any idea how to fix it? If the phone numbers are the ones associated with the iCloud/iTunes account on the recipients iPhone, it should work. It doesn’t have to be an email address. The contact will appear in a blue bubble rather than a green one if it will send them an iMessage. If you are trying to message an iPod Touch then check to make sure you have their email address in your contacts. You can also search/enter email addresses in the “To:” area. Can anyone on a group message retrieve phone numbers of the people the message is being sent to?